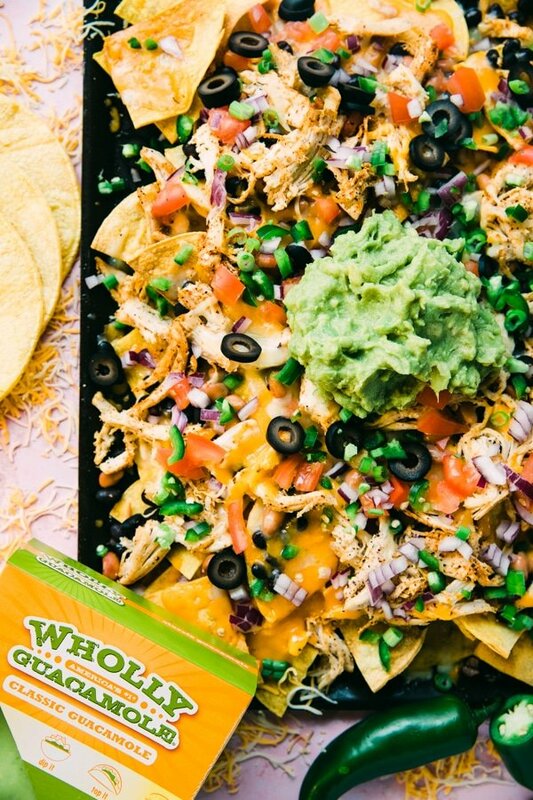 Sheet Pan Chicken Nachos loaded with guacamole are the perfect appetizer for game day or hosting guests! Disclosure: I created this blog content in partnership with WHOLLY GUACAMOLE® I was compensated for my work, and all opinions are solely my own. I always look forward to the person who makes the nachos. And this year, I’m the person bringing the delicious nachos, so I don’t have to wonder if there will be any there this year! I’m not sure if Super Bowl can even really be a Super Bowl without nachos. For me, they have to be fully loaded and have plenty of guacamole on top! 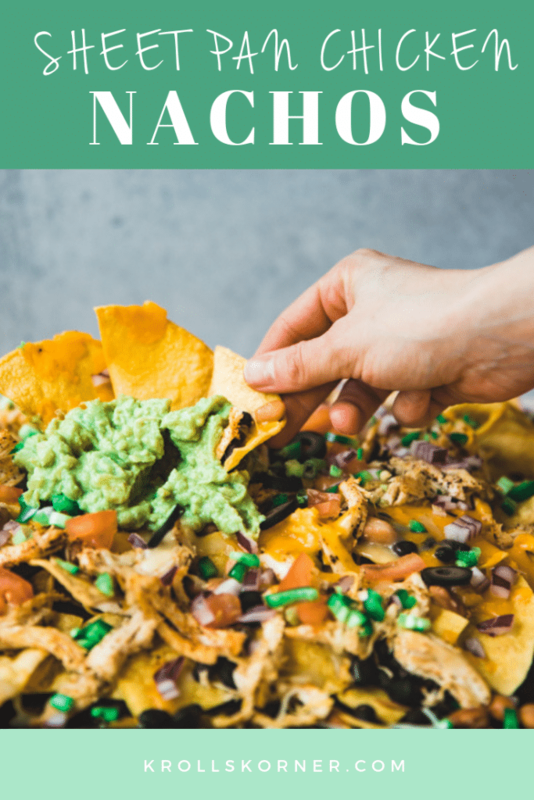 I’m solving your nacho appetizer needs with this super simple and tasty nacho recipe. Let me show you how you can make the BEST sheet pan nachos to your Super Bowl party! Avocados are not always ready when you need them; in fact, 38 percent of Americans have wanted to make guacamole but were unable to do so because the avocados weren’t ready yet or too ripe. Nearly 70% of avocado users throw away all or part of an avocado because it’s unusable?! Wholly Guacamole products can save you from the hassle of tricky avocados, which can throw a flag in your game day plan. There’s no need for mashing or prep, so it’s convenient and always ready to go when you need it, leaving more time to focus on the game. Wholly Guacamole is available nationwide at select stores and online at Walmart.com and MexGrocer.com. Wholly Guacamole offers easy peel-and-serve guacamole trays that are perfect for pairing with your favorite veggies and chips or adding a flavorful punch to game day recipes, like this Easy Sheet Pan Nacho recipe! Find more delicious game-day recipes by visiting the Wholly Guacamole website! Wholly Guacamole makes great-tasting guacamole using real ingredients and hand-scooped Hass Avocados, and it has NO added preservatives! Cut them in quarters and spray PAM on a baking sheet. Lightly spray each side of the tortilla with PAM as well. Preheat the oven to HI broil. Bake the tortilla in batches. You don’t want the sliced tortillas to be stacked on top of each other because they won’t get crispy! HI broil for 2 minutes on each side, and then work on to your next batch. Sprinkle the chips with a little salt when removed from the oven. Thanks to the avocado, guacamole provides several wonderful nutrients for our bodies! Healthy fats and essential fatty acids for our bodies! I hope you love this recipe and have an amazing Super Bowl! 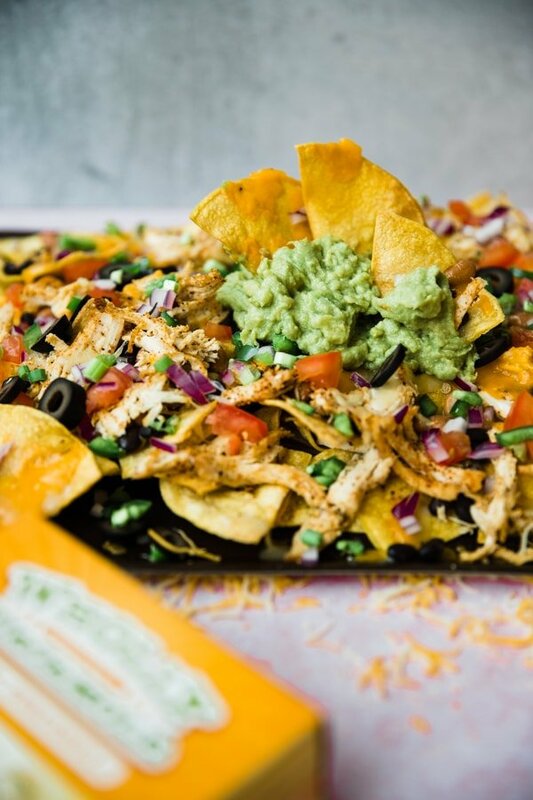 Game Day will be complete with these nachos loaded with guacamole! Make your own homemade tortilla chips! Arrange tortilla wedges in a single layer on baking sheet coated with cooking spray. Lightly coat tortillas with cooking spray as well on each side. Broil 2 minutes on each side or until lightly browned and crisp. Remove pan from oven. Next add taco seasoning, salt and pepper in chicken and mix well to season chicken. Layer chicken, cheese and beans on top of chips and bake at 350 degrees F for 5-7 minutes, or until cheese has melted over chips. 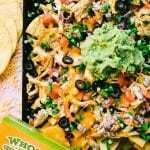 Add the Wholly Guacamole in the center of the chips and then add your favorite toppings to the nachos! 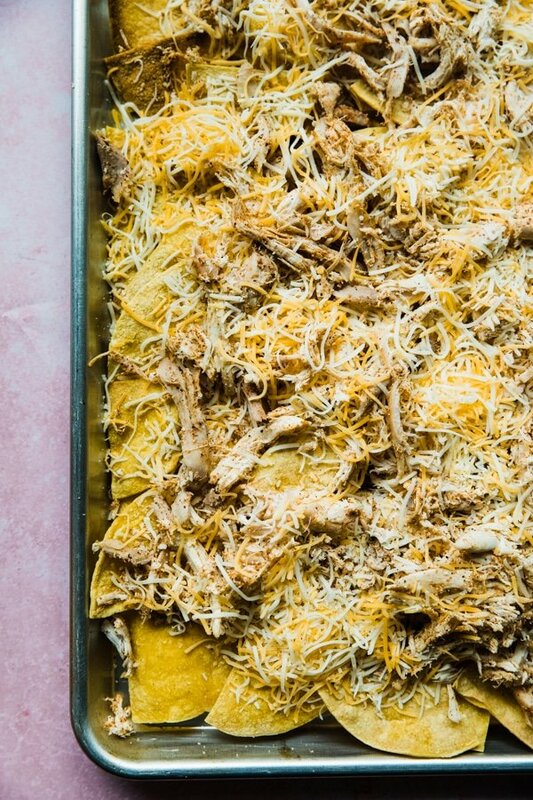 PIN THESE HEALTHY SHEET PAN CHICKEN NACHOS FOR LATER! Can’t beat a good pan of nachos! Love wholly guacamole, the best! Thank you Lisa! Wholly Guacamole is life changing! Everyone loved it!! Seriously doing this tomorrow. Thank you for giving me an idea as I am sick and have no idea what to tell my husband to make for dinner. Omg Mary – feel better!! Let me know what you think and thank you!!! Now, these are loaded nachos! I can see this as being dinner too! Love that you made your own chips. Very loaded 🙂 Thank you!! Thank you so much! Wholly Guacamole is the perfect way to complete these nachos 🙂 Enjoy! Saving this for March Madness snacks! Great recipe, we love guacamole!